An adorable new range of ten Miffy fabrics has been designed by The Craft Cotton Company, just in time for Easter and spring. There are two collections: ‘Miffy Bedtime’ and ‘Miffy Spring’, each with five gorgeous designs. The fabrics can be found in Hobbycraft, on the TV shopping channel Create and Craft, and in many independent retailers. The cute designs, all featuring the lovable bunny, are available in a fresh and vibrant range of colours perfect for springtime projects. They can be bought individually by the meter (from £8 per meter) or in Fat Quarter packs including all five designs (from £7). ‘Miffy Bedtime’ and ‘Miffy Spring’ are 100% cotton making them perfect for any craft, patchwork, quilting and dressmaking project. For some inspiration you can visit the Craft Cotton Co blog where you will find many wonderful tutorials and projects, all available free of charge. Keep scrolling on this page for a simple tutorial on how to make a bib out of squares from the Miffy fat quarter bundles – perfect for beginners! 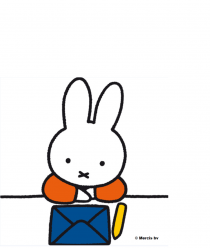 Those with slightly more experience, you can find a Miffy Mobile tutorial here. Half a yard of Miffy fabric. A bib template or use an old favourite bib as a template as I did. I have used a quarter inch sewing seam. Place your bib template onto the fabric and cut out two bib shapes. (If you are not using an old favourite, there are lots of templates you could use on the internet). Next place the Velcro pads onto the fabrics, line these up to make sure that you have placed them on the correct side of the fabrics. Next pin or clip the bib sides, right sides together; ensure you leave a gap at the bottom for turning. Sew these together then before turning to the right sides out, clip the curves. Turn to bib to the right sides out and press, then top stitch around the bib, this will not only give it a professional finished look, it will also sew the gap at the bottom up too.